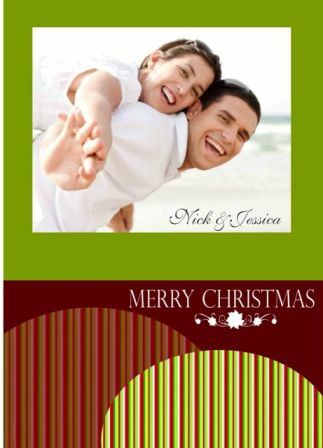 This card was made as a class sample. However, I made another one and gave it to my best friend. For this card I started with a white card and then cut out a card topper out of the black and white paper. Next I took my copic pens and colored in the background paper. Then I cut out the letters that spell out "love" and placed each letter on a maroon card stock mat. Using pop dots I placed them down the left side of the card . 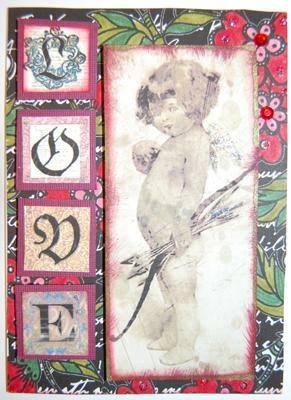 Next I took the little cupid picture and using my red & green radiant rain ink dauber I distressed the edges. I placed the image on the right side of the card and finished off with scatterings of red bling.